THE RHÔNE IS THE chief river of southeastern FRANCE, draining much of the western ALPS and connecting the regions of the interior to the MEDITERRANEAN coast. From its rise in the Swiss Alps to its wide DELTA, the Camargue, the river travels 500 mi (800 km), at first through narrow and twisting mountain valleys, but from Lyon to the sea (170 mi or 275 km), the river follows a nearly direct north-south line through a wide valley separating the alps from the mountains of the Massif Central. Although the river itself is too turbulent for commercial river traffic, its valley has been a thoroughfare from the MEDITERRANEAN SEA to the interior of France for centuries. The Rhône, together with its major tributaries to the north, the Saône and the Doubs, drains a basin of 39,207 square mi (100,531 square km). It begins on the Rhône glacier (altitude 6,000 ft or 1,743 m) on the Saint Gotthard massif in southern SWITZERLAND, then travels about 90 mi (150 km) through the canton of the Valais before it enters the Lake of Geneva (Lac Léman). It exits the lake at its opposite end, passing through the center of Geneva, then winds its way through the mountainous province of Savoy, taking several sharp turns before it reaches the broad valley of the lower Rhône, where it doubles in size with the confluence of the Saône at Lyon. Twelve cities with populations greater than 100,000 are located in this basin: Lausanne, Geneva, Lyon, Villeurbanne, Valence, and Avignon on the Rhône itself; Belfort, Besançon, and Dijon to the north in the Saône-Doubs basin; Grenoble and Annecy to the east on Alpine tributaries (Isère and Fier); and St-Étienne, which lies to the west, on the divide between the watershed of the Rhône and that of the Loire. Other major tributaries include the Arve in Switzerland, and the Ain, Ardèche, Gard, and Durance in France. All of these rivers begin as mountain-fed streams, making the currents of the Rhône after spring melts among of the most powerful in Europe. The upper reaches of the river have therefore been harnessed for hydroelectric power—one of the largest, Génissiat, where the Rhône divides the French Alps from the Jura range (southwest of Geneva, between Savoy and southern Burgundy), was built in 1937–49, creates a reservoir 14 mi (23 km) in length, and generates about 2 million kilowatt hours annually. Other dams and barriers are important for flood control on the river’s lower courses, lined with prosperous farms, orchards and vineyards. But enough water is let through to maintain the river’s other notable feature, its heavy levels of silt and mud, carried down from the mountains to the great delta of the Camargue. At 360 square mi (923 square km), the Camargue is the largest delta in western Europe. Roughly 700 million cubic ft (20 million cubic m) of mud are deposited each year, slowly moving the coast further out into the Mediterranean (for example, the town of Aigues-Mortes was originally built on the sea, but is now 3 mi or 5 km inland). The delta is a broad plain of reed marshes and lakes, with brine lagoons cut off from the sea by sandbars, watered by two main channels, the Grand Rhône (with 85 percent of the river’s flow) and the Petit Rhône. The delta has been protected as a wildlife refuge since the 1920s and is a haven for over 400 species of wild bird, notably the pink flamingo. Canals divert some of the river traffic to the larger cities of France’s Mediterranean coast (Montpellier and Martigues). 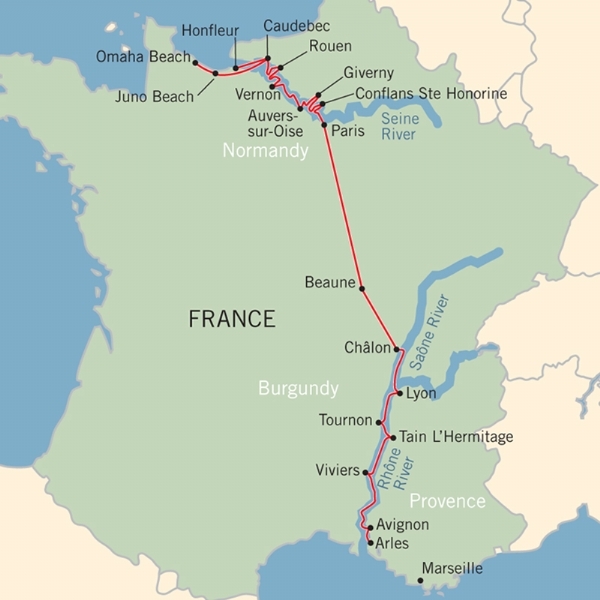 Other canals have been proposed to link this waterway, via the Saône, to the Rhine in northeastern France, but this has been temporarily shelved since 1997 because of environmental pressure groups. Tourism is also important to the economy of the lower Rhône basin, as visitors to France are drawn in great numbers to the Roman ruins at Orange and the Pont-du-Gard, the papal palaces of Avignon, and river sports in the gorges of the Ardèche.